Pittsburgh Penguins forward Conor Sheary will be out four to six weeks with an upper body injury, the team announced Wednesday. 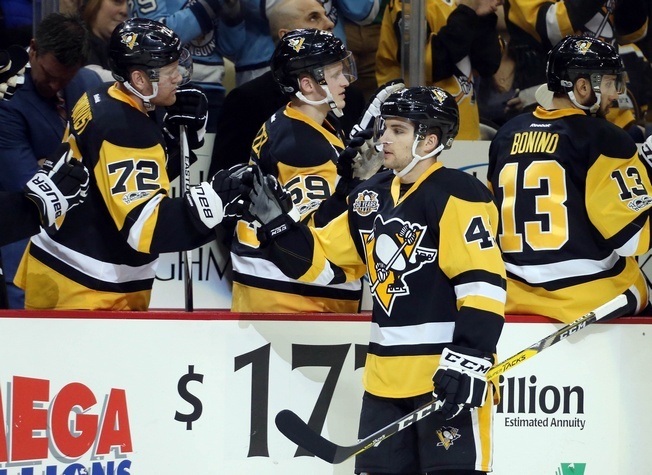 Sheary has been playing on Pittsburgh’s top line with Sidney Crosby and Bryan Rust. He has 35 points in 42 games thus far, including 17 goals and 18 assists, and has nine points in a four-game streak from January 16 to January 22. The 24-year-old is third on the team in goals and fourth on the team in points. It’s not exactly clear how Sheary was injured. He skated for nearly 17 minutes in Tuesday’s game against the Nashville Predators and picked up an assist, but he didn’t practice Wednesday and the injury was subsequently announced. The Penguins have some options for replacing him, with Matt Cullen one of the possibilities. Cullen wouldn’t be an immediate replacement, as he’s been out with a broken foot. The good news is that he practiced Wednesday and could be back to action on Friday. Another option is Jake Guentzel, who has seven points in 12 games this season and scored a goal on his first NHL shift. The 22-year-old seems to be set to develop into a handy natural scorer and would benefit from some time with Crosby. Scott Wilson is another possibility. He’s coming off a solid training camp and has been playing good hockey on the fourth line, but his grit might be a nice fit on the top unit. The same can be said for Chris Kunitz, although his chemistry on the fourth line may not be something the Penguins want to jeopardize. The Penguins also announced that Evgeni Malkin skated with Pittsburgh skills coach Ty Hennes before Wednesday’s practice and seems to be “progressing” after missing his second game. He’ll likely miss a third on Friday and isn’t quite set to join the team yet.